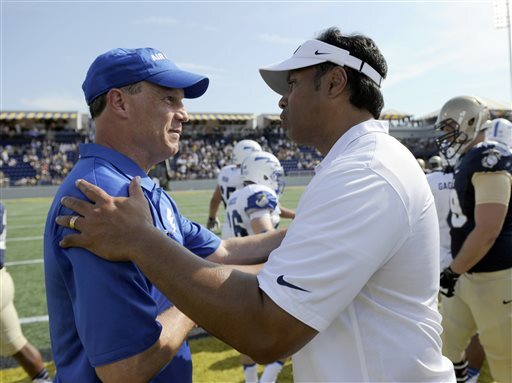 Navy head football coach Ken Niumatalolo stands one win away from a third-straight postseason bowl appearance, remains unbeaten against Army and is poised to lead the Midshipmen into football conference play for the first time in school history. Can you put a price on that? Yes: $1,574,810. That’s Niumatalolo’s 2014 salary, according to USA Today’s annual college football pay roundup, ranking him 60th out of the 121 Football Bowl Subdivision coaches listed. He easily outpaces Air Force’s Troy Calhoun ($892,750 in total compensation, 74th) and Army first-year coach Jeff Monken ($834,667, 77th). Niumatalolo’s pay would rank fourth among coaches in the American Athletic Conference, which will make Navy its 12th member in 2015, with two caveats: The salary of Temple’s Matt Rhule isn’t listed, and Southern Methodist head coach June Jones may not realize his entire $2 million-plus salary, given that he quit in September. Calhoun can claim the best-bang-for-buck title among the trio this season, leading the Falcons to an 8-2 record, a perfect 5-0 mark at home, and a Commander in Chief’s Trophy thanks to wins over the Black Knights (or whoever) and the Mids. His compensation ranks fourth in the Mountain West Conference behind coaches from Colorado State, Fresno State and Boise State — all of whom make less than Niumatalolo. Last year’s 2-10 mark broke a string of six straight bowl appearances that dated to Calhoun’s first year as head coach in Colorado Springs. 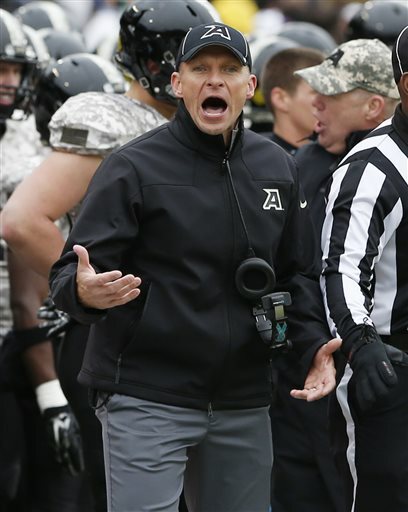 Monken, whose Army squad enters Saturday’s game against Fordham with a 3-7 record, could earn an extra $50,000 with a win Dec. 13 over Navy, USA Today reports.